The Canon CL-521GY Ink Cartridge is ideal for printing images and text in crisp colours. As a replacement cartridge the individual ink tanks are the perfect way to reduce waste and save money. The Canon CL-521GY Ink Cartridge is ideal for printing images and text in crisp colours. As a replacement cartridge the individual ink tanks are the perfect way to reduce waste and save money. 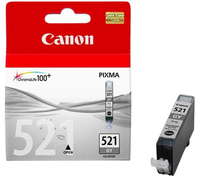 The cartridge is filled with 9ml of ink and provides quality results in Canon printers. Images and documents printed with original Canon inks are less likely to fade because the ink has been engineered to minimise the impact of light and gases in the air. Original Canon inks are manufactured to stringent safety and environmental standards. Canon offers a 100% satisfaction guarantee on all original Canon CL-511GY Ink Cartridges The Canon CL-521GY Ink Cartridge is perfect for producing sharp, smooth and clean printouts for everyday university, school, home and office use.